Earlier, observers recorded the location of a hand grenade of terrorists in 4-5 m to the south of the destroyed part of the bridge in Stanytsia Luhanska. 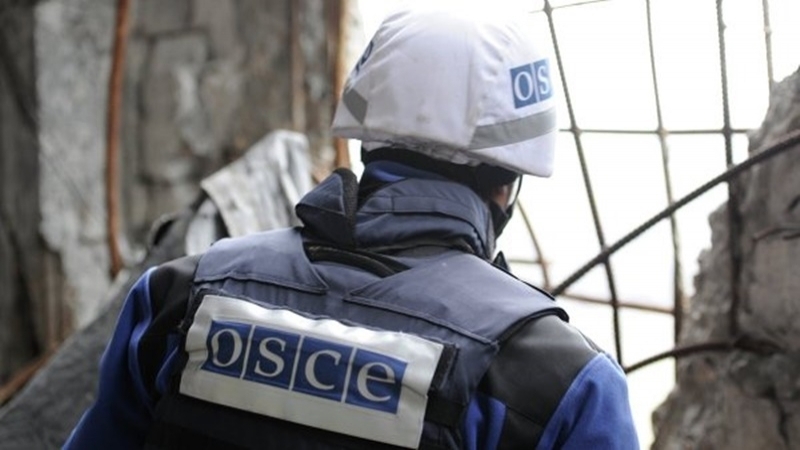 The hand grenade, which the militants placed near the ruined bridge in Stanitsa Luganskaya, was removed and no longer poses a threat to pedestrians, accrding to the report of the OSCE Special Monitoring Mission in Ukraine. The day before, the mission reported that near the position of the armed formations at 4-5 m south of the destroyed part of the bridge in Stanitsa Luganskaya, the SMM patrol first saw a hand grenade (with an inserted fuse and the pin of which was visible) attached to the edge of the fence at the knee level. “On 28 August, near an armed formations’ position 4-5m south of the broken part of Stanytsia Luhanska bridge, for the first time the SMM observed a hand grenade (with a fitted fuse and its pin visible) fixed to the side of a fence at knee-height. (The fence is along a narrow passage which is used by pedestrians when crossing the bridge.) On the other side of the passage, opposite the grenade, the SMM saw a wire and a hook attached to a tyre wall,” the report said. According to the SMM, the length of the wire allowed to reach across to the fence and be attached to the grenade which would enable it to be used as a booby trap. Earlier, on June 25 this year, the OSCE SMM opened a new Forward patrol base in Popasnaya Luhansk region. At the same time, the intentions of the SMM to open new bases on the territory uncontrolled by the Ukrainian government are hindered by the resistance from militants who do not provide the mission with the necessary security guarantees. Therefore, the plans to open such bases in Dokuchaevsk, Novoazovsk, Amvrosievka, Anthracite, Krasnodon have been only plans for several years. Reference. As of August 15, 2017, seven FPBs of the OSCE SMM operate in the areas under the control of the government: in Popasnaya, Volnovaha, Pokrovsk (formerly Krasnoarmeisk) and Svetlodarsk in the Donetsk region, as well as in Novoyaidar, Stanitsa Luganskaya and Schastye in Luhansk regions (the latter two were temporarily moved). In addition, three mission’s FPBs operate in areas beyond the control of the government, namely in Kadievka (formerly Stakhanov) of the Luhansk region, as well as Gorlovka and Debaltsevo of the Donetsk region.